Fireworks play an important role in various celebrations and festivals in India. Although meant for entertainment, injuries caused by them can have devastating consequences. Ocular injuries constitute about 20% of firework injuries., Trauma is one of the major causes of unilateral avoidable blindness in children., Visual impairment and disability in children can be a financial burden on the family and society. With vision 2020, giving high priority to avoidable blindness, especially in children, every attempt should be made to prevent such injuries and blindness in children. 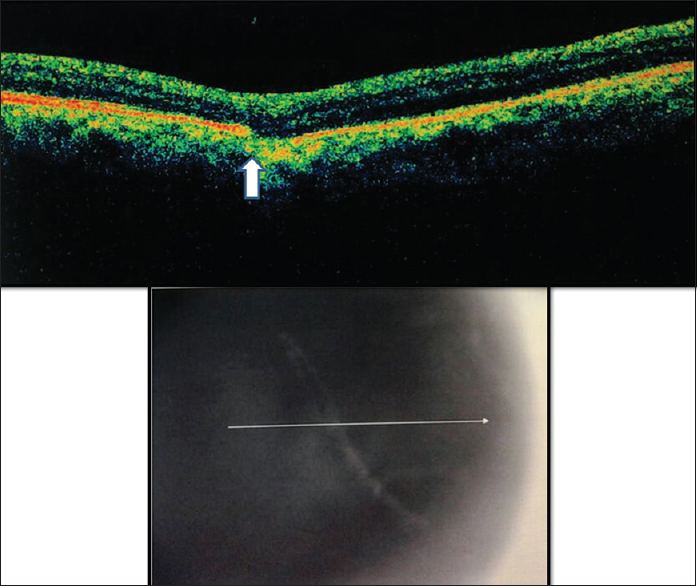 In this case report, we highlight choroidal rupture leading to irreversible blindness in a child and correlate its optical coherence tomography (OCT) finding. A 15-year-old boy came to our outpatient department (OPD) with firecracker injury to his right eye. The child was attending a wedding function where he was bursting a “Laxmi bomb,” and before he could run away after lighting it, it burst. He complained of painful sudden decrease of vision in his right eye since the trauma. The child was brought to our OPD 8 h postinjury. On examination, he was severely photophobic. His best-corrected visual acuity was counting fingers close to face in the right eye and 6/6 in the left eye (Snellen's chart). Slit-lamp examination of the right eye revealed circumcorneal congestion and epithelial defect involving 90% of cornea. Residues from the firecracker were seen in the fornices. There was no limbal ischemia and intraocular pressure (IOP) was normal digitally. Clotted blood was seen in the anterior chamber. Pupil was mid-dilated and showed relative afferent pupillary defect (RAPD). Rest of the details was not appreciable. Ultrasound B-scan failed to reveal any posterior segment abnormality. The left eye was essentially normal. The eye was cleaned. He was started on oral Vitamin C tablets and topically on hourly 1% prednisolone eye drops (Pred Forte, Allergan, Inc. Irvine, CA, USA) and 2% hypromellose eye ointment (Lacrigel, Sunways India Pvt. Ltd.) and 2% homatropine (Homide, Indoco Remedies Ltd.) three times a day. On first follow-up after 3 days, the epithelial defect had completely healed. The anterior segment was quiet and of normal depth. Pupil was mid-dilated and not reacting to light and pupillary reaction still showed RAPD. Lens was clear. Fundus showed small settled vitreous hemorrhage inferiorly. The disc and retinal vessels were normal. There were two lesions temporal to the disc: first one midway between disc and macula and the second one around 1 disc diameter from the fovea, at the level of choroid, suggestive of choroidal rupture [Figure 1]. IOP was 12 mmHg with Perkins. The steroids were tapered, and 0.09% bromfenac eye drop (Megabrom, Sun Pharmaceuticals Industries Ltd.) was added three times a day and the patient was asked to follow-up after a week. On review, the cornea showed early stromal scarring, normal limbal architecture, mid-dilated nonreactive pupil with RAPD, and clear lens. The vitreous hemorrhage had cleared and the choroidal ruptures were more clearly seen. Folds in the internal limiting membrane were noted at the macula. Spectral-domain OCT showed the break at the level of retinal pigment epithelium-choriocapillary level suggested choroidal rupture ([after correlating with the fundus picture], [Figure 2]). IOP was 28 mmHg with Perkins; steroids were withheld and continued only on bromfenac eye drops three times a day (TDS) and 0.5% carboxymethyl cellulose eye drops (Lubrex, Micro Labs Ltd.) six times a day. Gonioscopy, done at 1 month, did not reveal any significant abnormality. There was no evidence of choroidal neovascularization or retinal bleed after 1 month of follow-up. In a retrospective study, Viestenz analyzed reports of 376 patients with choroidal rupture. Fireworks-related injury accounted for 12% of cases. Ninety-two percent of choroidal ruptures were located at the posterior pole and concentric, 40% were submacular, and 12% outside the large temporal vessels (4% were located both centrally and peripherally). The final visual acuity in eyes with choroidal rupture is usually poor. In a study done in Southern India by John et al., they found only one case of choroidal rupture of 79 cases with blunt injury to eye following firecracker. Choroidal ruptures were often associated with iridodialysis, lens dislocation and contusion cataract, vitreous hemorrhage, complete retinal defects, ciliary body clefts, or hyphema rebleeding. Our patient had hyphema and small vitreous hemorrhage in addition to choroidal rupture. Both the choroidal ruptures were located at the posterior pole, with one of them being submacular. 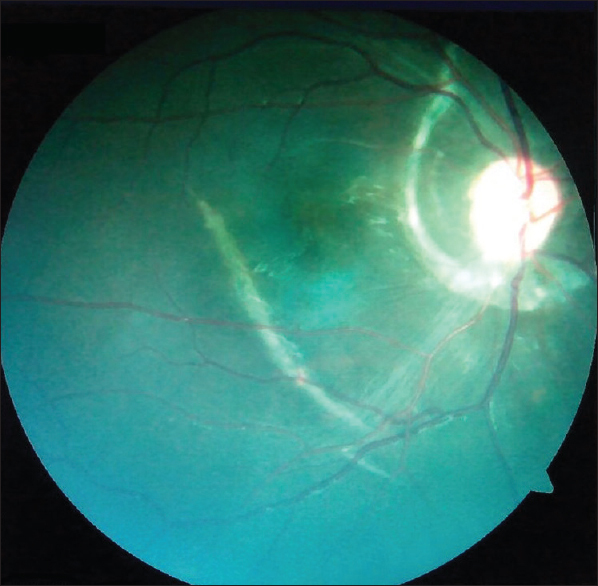 Given the location of choroidal rupture in our patient, he will need a long-term follow-up to watch for development of choroidal neovascularization. From academic point of view, in cases of trauma, it is essential to keep differential diagnosis of choroidal rupture in mind when vitreous hemorrhage precludes the view of retina, B-scan is normal, but a significant RAPD is present. The absence of parental supervision and failure to maintain safe distance from firecrackers are the main reasons for ocular injuries in children. Since in such cases prevention is better than cure, restricting fireworks to open spaces, promoting safe use via schools and media, and mandatory use of protective eyewear will have a positive impact in lowering incidences of such injuries. American Academy of Pediatrics: Committee on Injury and Poison Prevention. Fireworks-related injuries to children. Pediatrics 2001;108:190-1. Witsaman RJ, Comstock RD, Smith GA. Pediatric fireworks-related injuries in the United States: 1990-2003. Pediatrics 2006;118:296-303. Abbott J, Shah P. The epidemiology and etiology of pediatric ocular trauma. Surv Ophthalmol 2013;58:476-85. Bandrakalli P, Ganekal S, Jhanji V, Liang YB, Dorairaj S. Prevalence and causes of monocular childhood blindness in a rural population in Southern India. J Pediatr Ophthalmol Strabismus 2012;49:303-7. Viestenz A. Rupture of the choroid after eyeball contusion – An analysis based on the Erlangen ocular contusion registry (EOCR). Klin Monbl Augenheilkd 2004;221:713-9. John D, Philip SS, Mittal R, John SS, Paul P. Spectrum of ocular firework injuries in children: A 5-year retrospective study during a festive season in Southern India. Indian J Ophthalmol 2015;63:843-6.